German card manufacturer, WINTER AG, has added another Muhlbauer component to its offering for the German electronic health card market. Muhlbauer’s getID solution enables photo and data capture and editing functions. Roding, 15th March 2007 − The Muehlbauer technology group, international and independent consultant and manufacturer of innovative security solutions for the TECURITY® market and the WINTER AG, full service provider of services concerning chip cards in the domains of health, banking, IT / access and ticketing, announce in the context of the CeBIT 2007 the successful installation of the data capturing software Mühlbauer getID at the WINTER AG. The replacement of the existing health insurance card by the electronic health card is currently one of the hottest topics in the German and European card industry. Administrative procedures shall be accelerated with the introduction of the electronic health card and above all with the associated “telematic infrastructure.” Physically, the card differs primarily in the photo of the holder, which was integrated as a protection against card abuse. The new process standards, like the capturing of the image data and their automatic optimization, are taken over at the WINTER AG by the data capturing and image editing software, Mühlbauer getID. “We are happy to be able to integrate Mühlbauer’s solution of data capturing at the CeBIT, (hall 9, stand C52 / 14 eHealth) into our offer for the health insurance companies. In combination with the already existing personalization systems of Mühlbauer, WINTER AG is now in the position to offer the whole value chain starting with capturing, processing and data management, over card personalization until mailing to the clients of the health insurance companies,” said Stephan Breitenmoser of WINTER AG in describing the result of the mutual project. Mühlbauer AG shows at the CeBIT (hall 9, stand E18) the comprehensive competence in the domains of data capturing and image editing (Mühlbauer getID), as well as in personalization (CLP54 and CTP54). In addition to the exhibited systems, the company offers the new Card Mailing System “Card Mail 2000” to complete the process chain in the domain of the electronic health card. WINTER AG will show the whole process of the production of the electronic health card live. Parts of this are the data capturing of the insured, the image capturing, the image optimization, the data processing via CAMS (Card Management System), the codification, the personalization of the electronic health card, the creation of the PIN-letter and the subsequent mailing of the electronic health card and the PIN-letters. 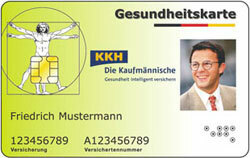 The visitors will receive a personalized and functional electronic health card. Muehlbauer has many years of experience in technologically innovative security solutions and benefits from the experience of more than 50 ID projects in the past. The company is the partner of many authorities and governments realizing Identity Card and electronic passport projects and meets the standards of the highest authorities. Muehlbauer is a global and independent consultant and manufacturer of technologically innovative security solutions in a market segment the company refers to as the TECURITY® market. With more than 1,600 employees at 26 locations on five continents, Muehlbauer is the leading provider of production systems for the Smart Card industry. Muehlbauer system solutions are suitable for the manufacture of any card type. They are used in the production of ID cards, ePassports, eVisa, contact and contactless cards, dual interface cards and multimedia cards. The products are, above that, suitable for the manufacture of Smart Labels for the security, supply chain, textile and retail industries. For years WINTER AG has manufactured health insurance cards as well as bank cards and intricate identification cards for high-security applications for authorities. Our responsibilities also include programming chip-OS, trust centre operations, key management as well as Photo capture and processing. The entire infrastructure meets highest security requirements and is suitable for all volumes.